Portland - Reigning FIFA Club World Cup Champions FC Bayern München are busy stateside preparing to put the star into Wednesday's Major League Soccer (MLS) All-Star test in Portland (kick-off 18:30 local time). Apart from sidelined midfielder Thiago Alcantara, Pep Guardiola will be able to pick from a full squad of undeniable Bundesliga talent for the Providence Park clash, including the Bavarians' 2014 FIFA World Cup-winning sextet of Manuel Neuer, Philipp Lahm, Jerome Boateng, Bastian Schweinsteiger, Mario Götze and Thomas Müller. "They could get 15 minutes, but nothing more," Guardiola said of his returning contingent. "They deserved to have an extended break with their families and to forget about football. 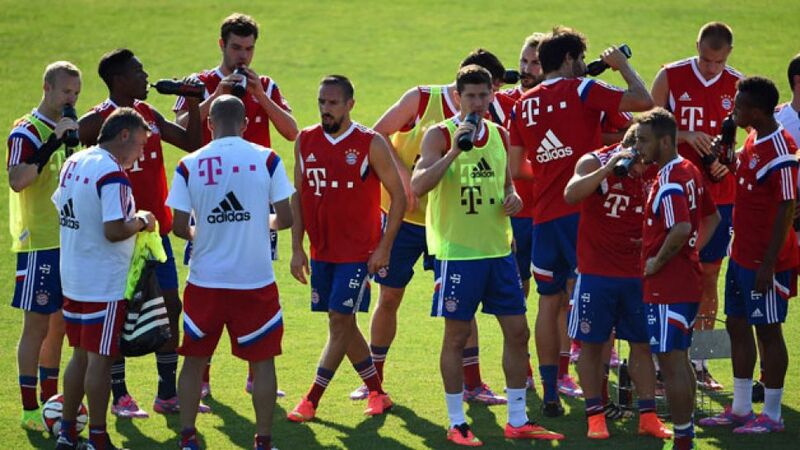 [World Cup semi-finalists Dante and Arjen Robben] haven't done much, but that's normal. We won't be taking any risks. The game's part of our preparations for next week when we'll contest the first trophy of the season [in the DFL Supercup]. We're really happy to be here and to be facing the best the MLS has to offer. We're only focusing on the All-Stars for now." New York Red Bulls forward Thierry Henry is expected to lead the line for the MLS delegation and is in no doubt who the All-Stars should be paying particularly close attention to in Portland. "If I had a son playing right now I'd say look at [Franck] Ribery and look at Müller," the Frenchman explained. "People, especially the media, love a guy with stepovers, tricks and things like that. But the game is what Müller is doing for me. That’s the game [...] Nowadays I find it annoying sometimes that people don’t give a lot of credit to guys that are unselfish. For me Franck represents that. Last year, he should've won the Golden Ball." Henry's three-year education at Guardiola's school of possession-based knocks should, meanwhile, come in handy when it comes to keeping tabs on a Bayern side that raced away with the Bundesliga title in record time in 2013/14. "You never get bored because you've always got the ball," the former FC Barcelona striker recalled. "It's really hard for the opposition. They know what they want to do, but they can't make it happen. You still try, though. Our guys will have to take on lots of fluids and be prepared to run and run." Guardiola's former pupil has a point, with Bayern currently unbeaten in pre-season, scoring ten goals in five outings so far. A narrow 1-0 win over CD Guadalajara was the product of their last appearance under the North American sun and though that encounter was an undeniable football extravaganza, the MLS All-Star contest is what fans from Boston to Honolulu have been really waiting for. "It's going to be a great game," enthused Bayern midfielder Pierre-Emile Hojbjerg. "The Americans are going mad for it. It's going to be a real spectacle."